This is the TekBots platform used in ECE 112: Introduction to Electrical & Computer Engineering - Concepts. It consists of four boards: motor controller board, analog board, charger board and sensor board. This TekBots base has the ability to avoid obstacles by sensing them with its two whiskers. Upon making contact with an obstacle, a TekBot robot will reverse then turn away from the object and proceed away from it. This section introduces the ECE 112 Lab Manual. It includes explanations of important symbols and lab safety tips. In this section, students learn the purpose of the various blocks of the charger board, along with building and testing those blocks. The TekBot mechanical base is also built. This section has four exercises to explore some useful electrical engineering concepts. The use of breadboards for prototyping is introduced. The exercises include determining power dissipation using the passive sign convention and measuring resistor combinations. This section explores the functions of diodes and bipolar junction transistors (BJTs) through various experiments. The motor controller board is also introduced to the TekBot system. This section examines the behavior of comparators in a circuit. The sensor and analog controller boards are also built, tested, and explained. At the end of the lab they are added to the TekBot, thereby completing the TekBot. 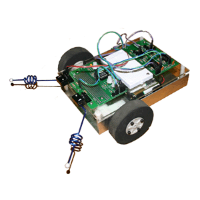 Students are encouraged to customize and improve upon the basic TekBot through innovative challenges. Contains instructions for using the digital multimeter (DMM), common schematic symbols, the resistor color codes, and a capacitor code chart. Contains a list of the parts used for each board of the TekBot. The list includes a description, image, and reference designator for each part. Use in conjunction with the schematics appendix to determine part placement. Contains a block diagram and schematic for each board of the TekBot. Contains the silkscreen for each board of the TekBot. Contains a list of the suppliers where TekBot parts are bought.